Within its artist-in-residence frame, my art presents for the second time in Vienna the Romanian artists Ana Maria Micu and CÄƒtÄƒlin PetriÅŸor. Their project is a work-in-progress focusing on making art as a self-explanatory process, surrounded by a specially created type of exhibits that can be continuously repositioned. They refer to visual system related to Craiova, the city where they live, searching for ways to further develop apparently finalized works by submitting them to a different context. The space is occupied with various art studio objects and materials, paintings, drawings, temporary installations and video footage. The visitors may look at the already installed works, the occurring changes and the overall working process. The artists will be available for talks and give presentations upon request regarding their projects. A finissage will mark the state the exhibition will achieve at the end of the residency. One of Micu's work samples consists in gradually adding visual and structural elements to a spatial background best suitable to exhibit two of her paintings. Out of white self-adhesive vinyl cuttings pasted on floor and wall areas she creates a large-scale drawing whose purpose is to unify the assemblage and to stand proof of her daily activity. PetriÅŸor continues several outdoor sketches he made in Craiova during the project "Abstract Circle" by covering them up with new layers of paint while protecting some areas with masking tape, which he partially wants to keep as an integrated element of the painting surface. He is also presenting a video processing of the documentation gathered during the same project. These works are put in relation with a display of still life objects made in black colored ice which are drawing specific patterns on the paper beneath them while they melt. Both artists are searching for a particular aesthetics resulted out of the improvisations one has to make when trying to adapt quickly to new conditions. They use available and discarded materials like plastic, paper, cardboard and wire for their reusable and ephemeral quality. This is put in contrast with painting as the art medium with the longest tradition and the finite character that the documentation of the project will acquire upon the completion of the program. The residency is organized by my art with the support of Austrom/ Ã–sterreichisch-RumÃ¤nische Gesellschaft. For further information or appointments please contact Ana Maria Micu at anamaria_micu@yahoo.com or +43 664 491 9204.
will bother ... for almost, 2014, oil and acryl on canvas, 44 x 49 cm. think twice about it? 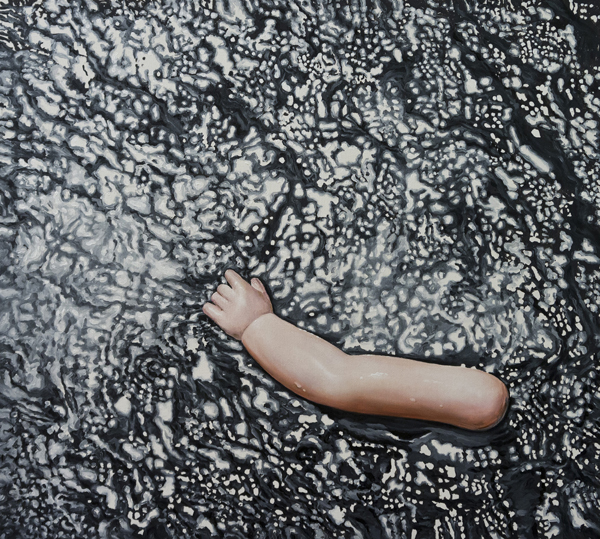 ... â€œenlightening, 2011, oil on canvas, 115 x 145 cm. I have recently redesigned my portfolio website and I have uploaded new content. Continuing with my long time preoccupation with picture-in-picture type of images, the concept of "scenography for painting" is the base for several sketches on paper. The computer screen is a new support I experiment with through some freehand digital drawings documented by real-time video capturing. I also gave individual presentation pages to each of my older projects to which I added "Image Search" - a photo collection supported by a statement that I consider to be significant for my current artistic focus. Ana Maria Micu (n. 1979) is a visual artist from Craiova, Romania that works with painting and related image transmitting methods. Her recent performance Installing the Image was a reconstruction of a minimal studio environment as an oversimplified optical illusion seen through a camera positioned aside. 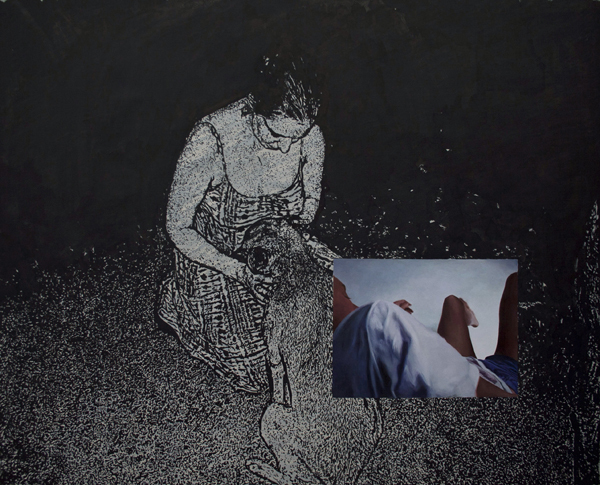 In 2012 she had the solo show Tender Heart, Keep Still at C-Space Gallery in Beijing. In the same year, together with CÄƒtÄƒlin PetriÅŸor, they presented A Conscious Choice For Temporary Blindness at Mind Set Art Center in Taipei. 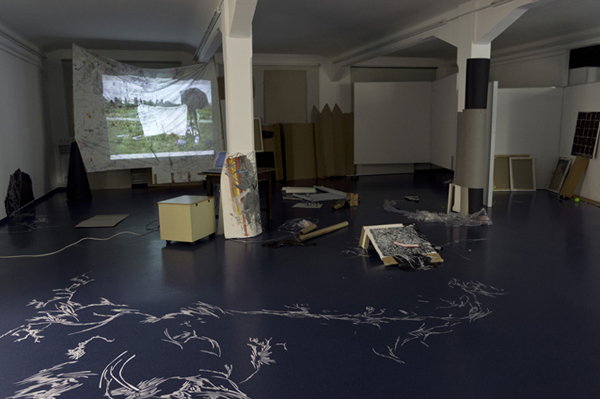 In 2010 one of her works was included in Tales of the Unexpected, curated by Maria Rus Bojan and Radek VÃ¡Åˆa at Dek 22 in Rotterdam. Micu graduated 10 years ago from the MFA of the University of Art and Design of Cluj-Napoca in Romania.